One of the biggest issues Mourinho’s Man Utd have encountered thus far has been their passive defensive style. With a lack of pressing and intensity United have struggled to force turnovers against several opponents. Furthermore their counter attacking game has not been strong enough to provide a threat when they eventually do win the ball. This combination has lead to a number of sterile halves where they have been unable to sustain a profitable offensive rhythm. It was therefore a slight surprise to see United pressing Liverpool quite high for much of the first half. In these high block phases Pogba would join Ibrahimovic in the first line as United pressed in a 4-4-2 shape. Pobga and Ibrahimovic shared pressing and covering responsibilities depending on the ball’s side. The ball-near forward would press the centre back whilst the ball-far would situationally mark Liverpool’s deepest midfielder. Behind the forwards Herrera and Fellaini acted in quite a man-oriented fashion, often following their direct opponents; Coutinho and Can respectively. There were two main things that instigated periods of tight man-oriented coverage. The first was when they were on the ball side, this common mechanism sought to deny Liverpool easy progression on the near side and to encourage them to switch the ball again. The second was when their direct opponents dropped towards the ball. These dropping movements meant the likes of Coutinho and Can would be facing their own goal and United’s man-orientations aimed to prevent them turning towards goal. With this man-oriented coverage United were able to force a number of turnovers in midfield and generally prevented Liverpool from building stability through their possession game. However there were some imperfections in United’s pressing. Firstly the ball-oriented shifting in the first line was only done at medium intensity. With Henderson’s dropping movements Liverpool were easily able to create space for a centre back to advance with the ball, and it took United relatively long periods to create access after these switches. Furthermore once Liverpool had beaten United’s first line they would drop behind the ball with Pogba operating just above the midfield line creating a 1-1 structure with Ibrahimovic ahead of him. These one forward block phases predictably gave United a worse ability to control Liverpool’s build-up. Ibrahimovic remained high and stayed between the ball and the ball-far centre back to keep Liverpool’s play on the same side and limit the space the midfielders had to cover. However this meant the ball-carrier was not under pressure meaning they could drive forwards to create overloads in the midfield area. Initially United’s pressing led to some inaccurate passing and Liverpool seemingly struggled to deal with the accumulating effects of United’s pressure. With the man-oriented nature of their opponents Liverpool found most of their passes being played under pressure and this increased the probability of mistakes. However as the game progressed Klopp’s men were able to use their build-up to find a route into the game. With Henderson’s joining the first line Liverpool could create a 3v2 and they frequently used half space switches between their centre backs to create opportunities to access the midfield area. As they were met with high resistance in the midfield Liverpool’s next task was to create the separation (dismarking) from United’s midfielders to progress the ball and they used a number of methods. One method Liverpool used to create a free man was the midfielders dropping into deep positions. With the 8s dropping deep in the half spaces they sought to receive the ball from the defenders free from the attention of United’s midfielders. Whilst they were able to do so on a number of occasions, the positions they were now receiving the ball in meant the connections to the forwards were weak. In addition to these movements Liverpool at times used positional rotations, by rotating positions they could theoretically take advantage of the time frames it would take United to re-organise their coverage. However the most effective method they used was Firming’s dropping movements. Creating an overload is, for obvious reasons, an effective way to create a free man. By using one of the forwards in midfield spaces Liverpool were able to overload the midfield as United’s defenders were reluctant to follow Firmino that far. On several occasions he was able to receive the ball directly from Lovren or Matip and could lay the ball off to escape the inevitable pressure. However his utility was not diminished when he could not receive the ball as his presence often attracted a United midfielder meaning one of Coutinho or Can were free. Example of Firmino dropping to help Liverpool access the midfield. Mourinho’s side essentially refused to build attacks from deep areas as they aimed to remove Liverpool’s pressing as a factor in the game. As such the likes of Pogba, Ibrahimovic and Fellaini were key in creating targets for long balls and allowing United to start attacks from Liverpool’s half. Once they managed to consolidate possession in Liverpool’s half they used combinations on the wings for three main outcomes. One was to combine and attempt to break through Liverpool’s defence on the ball-near side to reach the byline and set up a crossing opportunity. Alternately these combinations would draw Liverpool over to the ball side meaning they could switch the ball to create an isolation on the far side from where Young or Rashford could be in good positions to cross into the box. Lastly if these combinations failed the proximity to the touchline meant throw ins or other dead balls could result which had the effect of preventing counters but also possibly giving United opportunities to launch balls into the box. All these were clearly geared towards emphasising United’s height advantage as a means of creating scoring opportunities. However they were not largely successful with their inherent caution meaning they often lacked the presence to make such crosses effective. Despite a similarly chaotic start, Liverpool dominated much of the 2nd half. Initially some of Liverpool’s sustained periods of possession in United’s half came as a result of winning the 2nd balls after playing long from goal kicks. With these periods becoming more frequent Liverpool were able to force United into progressively deeper positions meaning building attacks from deep became practically unopposed later in the game. The task now facing the Anfield side was to break past United’s deep defensive structure. When forced into deeper positions United’s defensive structure was visibly similar to that used by Mourinho in so called “big games”. In typical Mourinho fashion the wingers were tasked with man-marking their respective full-backs which led to a number of different defensive line permutations between 5-4-1 and 6-3-1. Although there are a number of issues with defending in this manner it can be tough to break past the defensive line when it practically covers the entire width of the field. The midfield 3 tried to maintain stable distances to each other but also aimed to keep the distance to their direct opponents as small as possible. The full-backs were also heavily man-oriented even following their opponents when it meant leaving the defensive line. Generally the defensive line tried to close any space behind the midfield dynamically which gave them a fairly high level of resistance. Faced by a defence with a crowded last line and fairly strong cover from midfield, Klopp implemented a number of techniques to create openings and these were fairly effective. One of these methods was to push both full-backs high on the flanks forcing United into a 6-3-1 shape with Young and Rashford positioned along the defensive line. 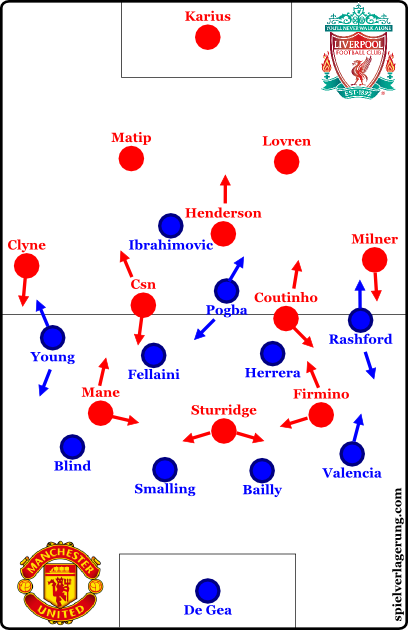 The effect on the game was two fold; Liverpool could now control United’s counter attacks very easily since the main outlets were in such deep positions and in close proximity to their opponents. Secondly there was now increased space to the side of United’s midfielders where the likes of Can, Lallana and Coutinho could operate. From this 6-3-1 shape Blind and Valencia felt comfortable following Sturridge or Firmino into deep positions since the players around them provided a feeling of stability. Liverpool used these dropping movements from the forwards to open gaps in the half spaces and these were quickly filled with late runs from the midfield players. Can’s late run takes advantage of the open half space caused by United’s man-oriented movements. This scheme led to Can’s chance, perhaps Liverpool’s best chance of the night, and the away side had De Gea to thank for keeping it out. The addition of Lallana enhanced this movement pattern as he added not only his guile and press resistance but also his well timed runs beyond the front line. In what was a game of very few chances and almost no clear chances Mourinho will be the more satisfied coach with a draw that prevents a direct rival gaining 3 points at home. However the extent of this satisfaction has been exaggerated in some quarters; the draw leaves United 5 points off the top of the table. Perhaps more worrying for United is the form of the likes of City, Arsenal, Liverpool and Tottenham who happen to currently make up the top four positions, and Chelsea their next opponents who lie just outside it. As for Liverpool the result was disappointing but as goalkeeper Karius pointed out the manner of United’s performance at times is an indication of their great progress. With the form they have shown thus far Klopp’s side appear to be players in this title race and the Kop will be dreaming of ending their title drought come May. How far do you think this Jose side can go? The issue seems to be who should be playing behind the striker. I’m Not entirely sure, they haven’t been impressive so far but I guess we should expect some improvement. I don’t expect them to win or seriously challenge for the title this season from what I’ve seen.